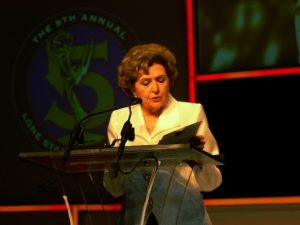 Bobbie Wygant presented an EMMY Award to a fellow journalist during the 5th Annual Lone Star EMMY Awards. On Monday, April 22, Texas television legend Bobbie Wygant will be at The Sixth Floor Museum at Dealey Plaza to share insights and memories from her seven-decade career in broadcasting, including her experience broadcasting live on November 22, 1963, as news broke of the assassination of President John F. Kennedy. Tickets to “70 Years of Texas Television: An Evening with Bobbie Wygant” are $20 and include a reception, parking and a private viewing of the “55 Years” exhibit. Tickets are available at jfk.org.